We take the work out of following the weather! Are you tired of being caught off guard by price fluctuations in the produce markets due to weather related issues? Would you like to follow the weather in the major growing regions but don’t have the time to check your basic weather app everyday or even know which locations are in producing right now? If your answers are yes, then Weathermelon is for you!! Weathermelon consolidates weather info for all major growing regions of every commodity into one easy to use application. 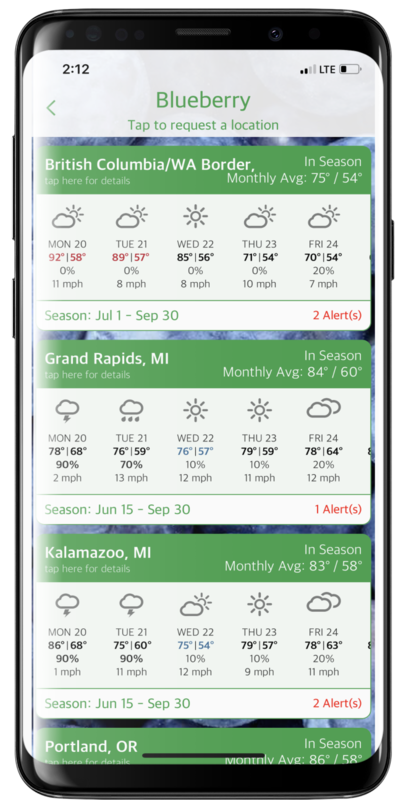 Based on the 10-day forecasts, Weathermelon sends daily alerts to inform you of potential weather issues in growing regions specific to your commodities. It also provides information about harvest dates for each growing region. We keep you on top of the weather so you can stay ahead of the markets! Weathermelon is designed by Produce people for Produce people. The idea and design of the app are simple, which in turn make for a very easy user experience. After a couple of simple steps you will be up and running tracking the weather wherever it may be and for whatever commodity you buy or sell. Simply hit the "follow" button on any commodity you wish follow. You can choose to "follow" as many commodities as you wish. You will then begin to receive daily weather alerts for IN-SEASON growing regions of each commodity. Alerts are sent at 8:00 AM ET / 5:00 AM PT. You can view all IN-Season and OUT-of Season growing regions for each commodity. IN-Season regions receive daily alerts and are shaded GREEN, while Out-of season regions are shaded brown. Abnormally high temps are shaded RED and abnormally low temps are shaded BLUE. For each region we provide a 10 day forecast, average hi/low monthly temp, estimated harvest start/end dates. Inside each "region weather placard" you will find more detailed weather information along with location maps. Sit back and wait for the alerts to come in. We send alerts based upon temps above or below the average norm, > 40% chance of rain, oncoming freezes, and all National Weather Service alerts for all US regions. All alerts are based on the 10 day forecast and weather data is provided by Weather Underground. Not only do you get the percentage chance of rain like most weather apps but get the predicted forecast amount which is the most important data concerning rain.